It doesn’t take much digging into the history of the craft-brewing movement to run into Fritz Maytag and his Anchor Brewing Company. In 1965, Maytag rescued the failing sixty-nine year old Steam Beer Brewing Company. While he had no prior experience in the brewing world, through sheer drive and determination Fritz was able to turn the brewery around, in the process renaming it after its most popular beer. Rather than chase the mega-brewers, Anchor decided to position itself as a traditional brewery using traditional ingredients to court the more discriminating beer drinkers that pined for authenticity. Fritz Maytag was a true pioneer in the craft-brewing world, helping to start a revolution we can all be thankful for. 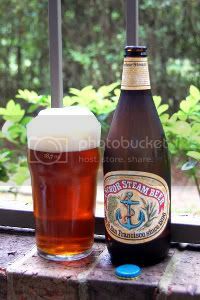 The flagship Anchor brew is Anchor Steam, which happens to be the quintessential Steam beer. Steam beer dates back to the mid-1800s, when settlers in California improvised a way of brewing beer with lager yeasts at warmer ale temperatures. The style we now know as Steam beer is really California Common beer. Anchor Steam typifies the style and as it evolved from traditional Steam beer the California Common style came into being. Verdict: This beer easily earns its status as an absolute legend by being both crucial to the revival of American beer and downright delicious. We owe this beer a lot, buy some and enjoy a few pints of your history. First, thank you so much for the kind words. As for a good first timer's Stout, have you tried Guinness Draught? While I haven't reviewed it on PintLog yet, it is one of my absolute favorite beers. If possible, try it in a bar/pub. Not only will it be cheaper than investing in a 4-pack of cans but it will just be a better experience (provided you pick a good bartender). If you're willing to go with a bit more kick, I would also recommend Guinness Extra Stout, which is a more traditional version of Guinness. There are very few lagers that I like, but this is one of them. It has a complexity that few other beers have.